Butchers broom is native to the area near the Mediterranean sea. It has since spread all over Europe and in the South Americas. It is a small bush, evergreen with sharp ends. It is known by various common names, but the main one is Jew's Myrtle. Its Latin name is Ruscus Aculeatus. 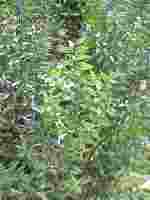 Butcher's broom is mainly known for its silicon properties and diuretic properties. The diuretic properties is used against swelling, in other words body water retention. Also used as a mild laxative. With hemorrhoids it is used for its silicon properties. It is used to glue up broken veins and strengthen the veins walls. Therefore keeps a good blood flow. This property is very good for hemorrhoids. It is can be consumed as a tea or as an ointment/cream, or as a suppository or it can even be made up in capsule form. Although it is a very well known herb and has the exact properties needed to help with treatment for bleeding hemorrhoid. I personally used this product, because I heard so many good things about it. Especially that it contained silicone properties, it made sense that it would work with hemorrhoids. Unfortunately, it just did not help me in any way. This was a great disappointment, as it is widely suggested by many different sources. The only concern that I do have, is that maybe it did not work with my type of hemorrhoids. As my hemorrhoids were already at a bad stage when I tried this out. Maybe it does work with a reasonably new type of hemorrhoid. This I cannot answer, and I repeat, because my hemorrhoids were already at stage four, and none of my patients have used this product. I am therefore not qualified to give advice as to whether this product works with a relevant new case of hemorrhoids. But I can definitely say that it does not work with a more severe case of hemorrhoids.